The close links between Formula Palmer Audi and Formula Two have developed further with the news that the winner of the junior series in 2010 will get £100,000 off the cost of running in the next year’s F2 campaign. This will leave the champion having to raise just £185,00 to compete in a series where the prize is a test in a Williams F1 car – compared with the million pound-plus cost of a GP2 season. The scholarship is worth twice that offered to the 2009 champion Richard Plant, who took part in the F2 testing at Valencia last month and hopes to move up to the senior series in 2010. 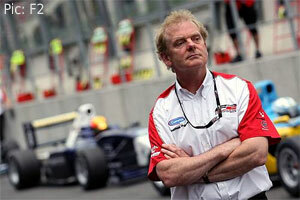 Both Formula Palmer Audi and Formula Two are run by Jonathan Palmer’s Motorsport Vision company. He said: “Our philosophy with both FPA and F2 is to provide exceptional affordability, which has never been more important. He is also offering free F2 tests to the top six finishers in FPA. Categorised under F2, tagged under Formula Palmer Audi, Formula Two, Jonathan Palmer.